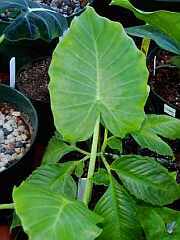 So far, this is a small alocasia with bright green leaves. Here it is, starting to thrive in the greenhouse and smothering a small Amorphophallus bulbifer. Leaf closeup, just after watering.